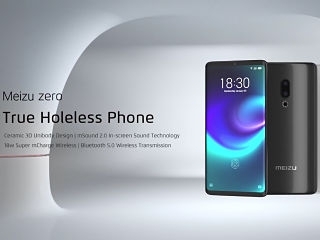 The Meizu Zero is an innovative smartphone! Taking an out of the ordinary to the world of mobiles, Meizu along with Vivo, have released their latest models. Called Zero and Vivo Apex 2019, the smartphones do not feature any holes according to the manufacturer. According to Meizu, a specific and radical change in the design of smartphones is necessary. Indeed, its latest model, the Zero, does not have any ports and comes with no buttons. This means no jacks for a headphone, no SIM card slots and no speaker grilles. The smartphone also features bezel-less screen. Equipped with a Qualcomm Snapdragon 845 processor, the Meizu Zero phone will only be chargeable wirelessly, with a fast 18W system. Listening to music will be made possible on the phone via Bluetooth headphones. Aside from optical in-display fingerprint sensors, the smartphone’s screen can be turned into a speaker for audio calls. Announced at the same time is the Vivo Apex 2019. Although it is only a prototype for the time being, it offers similar features as the previous device. The smartphone also does not offer any ports, however it has a higher level of specs. The gadget comes with a 6.39-inch display, a 5G-compatible Snapdragon 855 chipset and 12 GB of RAM. More information about both the Zero and the Vivo Apex 2019 is expected to be unveiled during the Mobile World Congress. The international event is scheduled to begin on February 25th, 2019.